In an alphabetical order get to know #GetVunked2015 team No. Five - Need2Park & Co-founders Kaspar Kikerpill and Madis Lempu. With sparkles in their eyes they are about to conquer the world of parking, so that it would be pleasant for the one who wants to park and the one who has lots. Geographically scattered but strong in using communication tools to work side-by-side, we give you Need2Park. Kaspar & Madis, what entrepreneurs do you admire and why? Kaspar: "I admire entrepreneurs who have interests outside of the company. For example, Steve Ballmer; I love his energy and how he does not think twice about what people think of him. After his successful career, he has pursued his lifelong dream of owning a professional basketball team. It is not just that he bought the team, it is his level of commitment to this particular team that I envy, or would like to have. He might seem weird, loud and at times dorky, but he loves what he is doing, and he is not afraid to show it. Long story short, I love entrepreneurs who stay true to themselves. It is easy to see if someone is pretending to be somebody they are not." Madis: "There are many for different situations. There is no one great leader I’m following, I’ve mixed my own and am trying to be the one I would truly admire." Madis: "Kaspar and I have been friends for some time now, and we have done many projects before it turned out to be a business relationship. This is our second business together, and so far, it seems that our cooperation works and produces new ideas that are actually useful for other people as well. Our CTO, Kaitti, is way more experienced in the field of business and technology, this guy has more than 25 years of experience in this field, we can just say that we are glad and lucky that he joined our team. Our latest improvements are Kert and Indrek, they are the amazing wizards behind the software. Because we are all so different in terms of age, fields of interest and the lives we are living daily, the start-up is what connects us. We have always something to talk about with each other. As a young team, we are also still learning about each other, but that’s the point, it’s more than interesting with these guys." Kaspar: "We have a very diverse team who work from different geographical locations. For example, Madis and I work from a distance, since I am currently finishing my studies in the Netherlands at the moment. I have daily Skype calls with Madis, who is running the company from Estonia. He is taking part in the SWG and VUNK events. With the rest of the team we have a Skype call at least once a week for couple of hours, where we go over the most important goals and achievements. 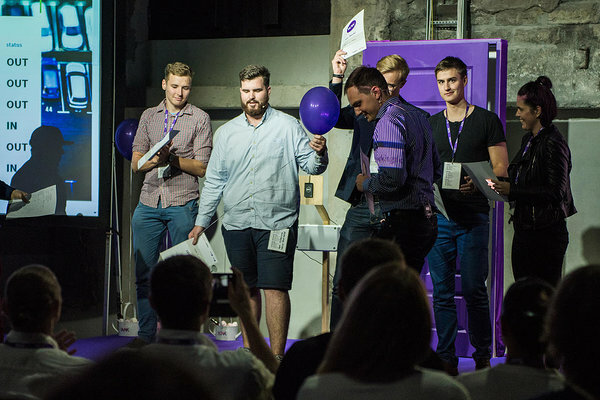 Kert and Indrek work remotely from Tartu and are in constant contact with the rest of the team through Skype and other means of communication. They have set up their own work station there where they can snugly work with the software development. Our world traveller, Kaitti, has returned from Iran and is commuting between Tartu and Tallinn." Madis: "I think in our case success means, with the growth of our business the friendship also grows. We really like to build something people want to be part of and be proud that they are. This is something many successful people don’t know how to achieve." Kaspar: "In addition we aim for having global success. If our solution can find a parking spot for our drivers in every major city in the world, then we have succeeded. We won’t stop until our users can find a parking spot everywhere they go. We want to offer our users a way to forget parking problems. Creating synergy between the parking lot owner and the driver is the key to a happier life. At least a little bit happier." Kaspar: "People have no problems finding a parking spot. They will just use an extremely easy to use app that informs them about the most convenient locations to park for them. Also, they can use it globally and never worry about finding a parking spot in a foreign city. The parking industry is no longer controlled by gigantic parking operators, but by the parking lot owners themselves who happen to use the best software in the world to do that – Need2Park." 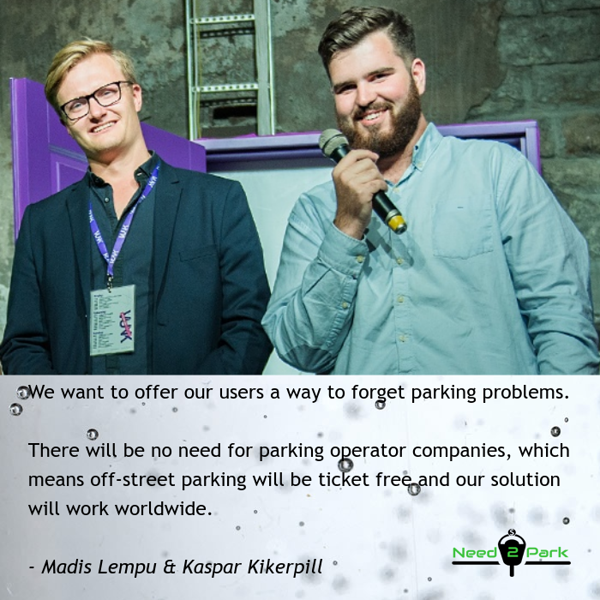 Madis: "To make it short then in five years time there is actually no need for parking operator companies, which means off-street parking will be ticket free and our solution will work worldwide."